Since being introduced to wheelchair basketball in 2013, Dylan has been very successful in the sport. The two-time gold medallist in the Kevin Coombes Cup for the 2014 and 2015 under 23s championships has also represented Australia in the mens development team in Dubai. Dylan completed his final year of high school in 2015 as well as a certificate three in fitness, whilst also working in customer service casually. Dylan now attends university. 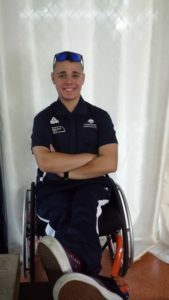 After a skateboarding incident in 2013 causing paraplegia from the waist down, Dylan was still in hospital when he attended a trial session for wheelchair basketball. Dylan has been playing ever since and his two future goals are competing in the 2017 under-23s world championships as well as playing for the Australian Rollers in the 2020 Paralympics.